Since 1924, Purity has been creating the delicious, appealing products that have become favourites with young and old alike. Our delectable cookies, candies, specialty biscuits, syrups, jams and more are all made on-site at our factory, with the finest ingredients and utmost attention to quality and taste. Take a look at our selection of mouthwatering products. You’re sure to find something that satisfies! Moist, jam-filled sponge cookies made with all-vegetable shortening. A traditional favourite. Jelly-filled sponge cookies that are a welcome treat any time of day. Our version of the classic cookie. Chocolate chips are the number one ingredient. A wide variety of tasty cookies from which to choose. What’s your favourite? Our delicious Coconut cookies with a tall glass of ice cold milk or a hot beverage at tea-time makes for a delightful treat. A tasty combination of nutritious oatmeal and dried raisins. Traditional, delicious, and made with the best ingredients. The name comes from the “snap” sound when you break it. A wide variety of sweet biscuits makes for a satisfying snack for any taste. A different type of cookie in each section. Great for those who enjoy variety or for larger gatherings. Our flaky layered crackers have a crisp, melt-in-your mouth texture. Perfect on their own, as a light lunch or with a bowl of soup. All of our biscuit products are low in fat and have no cholesterol, but have varying textures and flavours. Try them all! Made by skilled candy makers since the 1920′s, most of the hard candies are still hand sugared. Made with real fruit and local wild Newfoundland berries, these spreads taste as good as homemade. Our specialty biscuits are baked with the finest ingredients and flavours you’ll love. Mouthwatering and moreish, they make for excellent after-dinner or anytime snacks. A staple in the Arctic and Northwestern regions of Canada, providing nourishment where cooking isn’t always an option. A firm biscuit baked in a time-honoured tradition to create its unique texture. Predominantly used to prepare traditional Fish and Brewis, but is also used with other dishes. A slightly softer and sweeter version of our Hard Bread, which comes from the added sugar and shortening, is primarily a snack food. Caught in the cold Atlantic waters and treated with a process that has been handed down for generations. 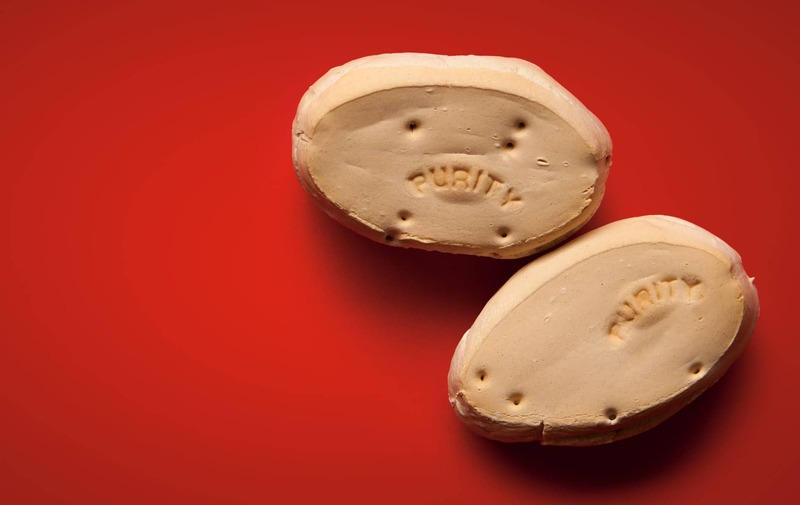 Purity brings its tradition of quality and taste in a ready-to-eat product. A longtime tradition in Newfoundland, especially at Christmas, these concentrated fruit-flavoured drinks are great as an everyday treat or for special occasions. Looking for that perfect gift for your family, friends, or clients? Why not give them a taste of home?